Awhile ago, YouTube changed rather dramatically to link the G+ social network into its comment system. That was a bit of a mess. However, at the same time, they updated how the channel page works and I now can create sections on the channel page for certain videos. I've since created a section for Angle Madness besides a few other projects, like the Tim Burton Table (No Comment #2), the Sculpted Mahogany Vanity, and the Quilted Maple Frames. The videos under each section are in reverse chronological order and if you are logged into YouTube, it will remember which videos you've seen already and watermark the thumbnail with "Watched". Makes it a bit easier to navigate around. -yawn- boring post! ...but here's a cool video on making trees with a lathe... someday, I'd like to try this! Before closing up the drawer boxes with the top panel, they need glue blocks in the corners. Normally this isn't something that needs much discussion, but these blocks are special (as you can see from the photo!) Each needs to fit into a corner gluing two sides and a bottom panel. With the angles, each drawer tier has 16 custom-fitted glue blocks; some aspects are mirror imaged from other blocks, but each requires a different saw setup. Won't bore you cutting them all, but will show how you extract the included angle between arbitrary sides like those in this project so you can exactly match the angle for a block. We'll also make a unique marking tool to eliminate some of the error I was seeing in marking the panels for the rabbets. Overall, it's an odds 'n' ends episode. Next episode, you'll start with the boxes all glued up (top panel as well) and sanded ready for the outside surface finish. 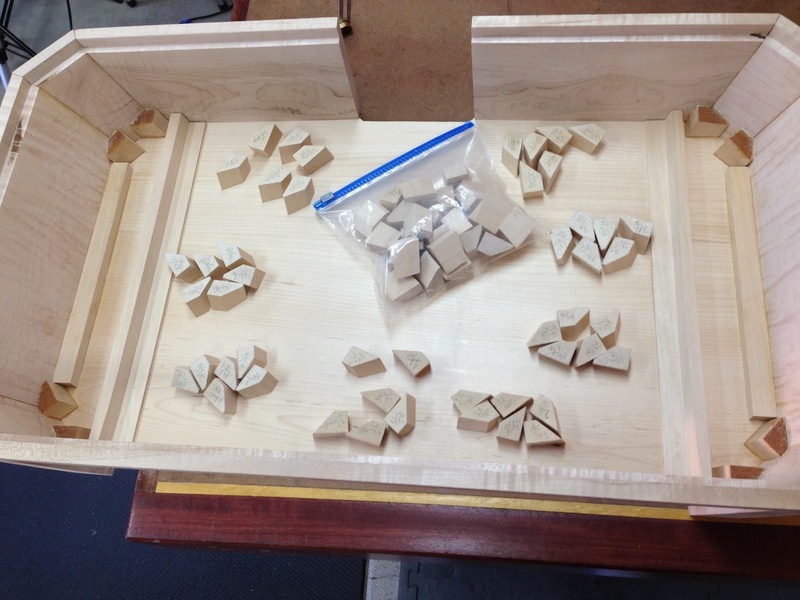 I chatted with Charles Neil about some goals for the final project's finish for the boxes, burls, and the lower support box in Wengé I haven't yet started (it's just a box! no, really!!) I gave him a run down of the design including some elements we haven't worked on yet and why they are there. He came back with 2-3 schedules for the boxes and some great tips for what I wanted on the burls. I have some experiments to run this week to see what the final finish will be; we'll go over the options and how they worked out, too, in case something that didn't work for this will work for something you are working on.